Hollybeary Creations : YNS Oct. Release Sneaks!! It's time for a peek at the October Release from Your Next Stamp!!! Be sure to head over to the YNS Blog for a complete list of Design Team blogs so you can see all the projects created with the new product arriving in the store tonight at 10pm est!! 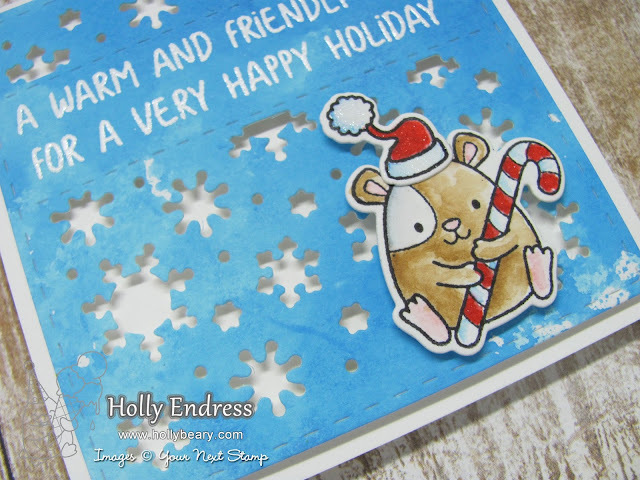 My project features a Fun new set called Hammie Holiday Fun and it's coordinating dies. I'm also using the new Mini Snowflake panel die. This is a 3x3 panel that's perfect for mini cards or tags. I created a Distress Oxide Ink background on a piece of Bristol Smooth paper and then I die cut the piece using the Mini Snowflake panel die. I stamped a sentiment from the Hammie set and heat embossed it with White Embossing Powder. Then I added lots of foam tape to the back and adhered it to a 3 1/4" by 3 1/4" card. I stamped the Hammie image and the little hat onto some Bristol Smooth paper using Archival Black ink and I colored them in with Distress Markers and an Aqua brush. Once they were dry I used the coordinating dies to cut them out and adhered them to the front of the card with some foam tape. For a touch of Sparkle, I added some Red & Clear Wink of Stella to parts of the image. 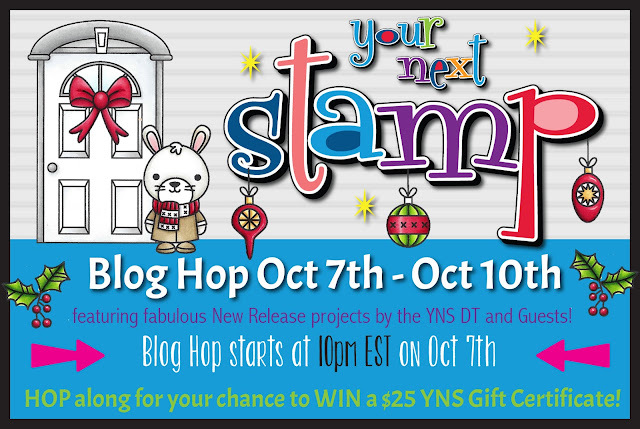 Head over to the YNS Blog for more sneak projects and be sure to join us at 10pm est tonight for our Blog Hop and full product Reveal... all the new products will be available in the store as well. Your card is adorable !! The hammie is so cute and the snowflake panel is awesome ! That little guy is so cute, great card Holly! Super cute card Holly! Great snowy background! Lil' Hammie is so cute and perfect for a whimsical look at Christmas.